This week in the war, on 14 January 1944, the Americans bombarded German forces defending the Gustav Line—the last obstacle before the Italian town of Cassino and the famous Monte Cassino abbey. 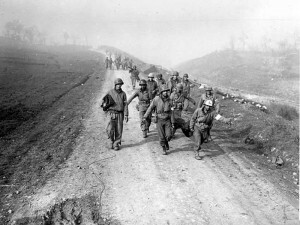 The following day, the US II Corps mounted an attack towards the Rapido River and captured Mount Trocchio. The Americans seemed poised to break through the Gustav Line and, from there, to advance on Rome. This entry was posted in World War II and tagged Gustav Line, Italy. Bookmark the permalink.